TimeZone : Rolex - Modern » Dare I ask you Rolex connoisseurs a question? Yes I do! :-) And I shall be very grateful for every response - so thank you in advance! the "electric blue" version of the MILGAUSS, which intrigues me because of the front glass and the sort of unorthodox glance, including the special seconds hand. On the Rolex website I read that the Milgauss has calibre 3131, the Exp. 3132, but what is actually the difference? The PR seems to be the same. I guess it's the protection and maybe the green front glass that makes Milgauss more expensive than the Explorer. Or is it? And finally to you who have owned or still own both. Which one has been the best companion to you in the course of time. ...on the Explorer (left). The additional magnetic protection on the Milgauss is via the inner case that protects the entire movement from magnetic fields. This inner case makes the outer case a few millimeters thicker on the Milgauss vs the Explorer. 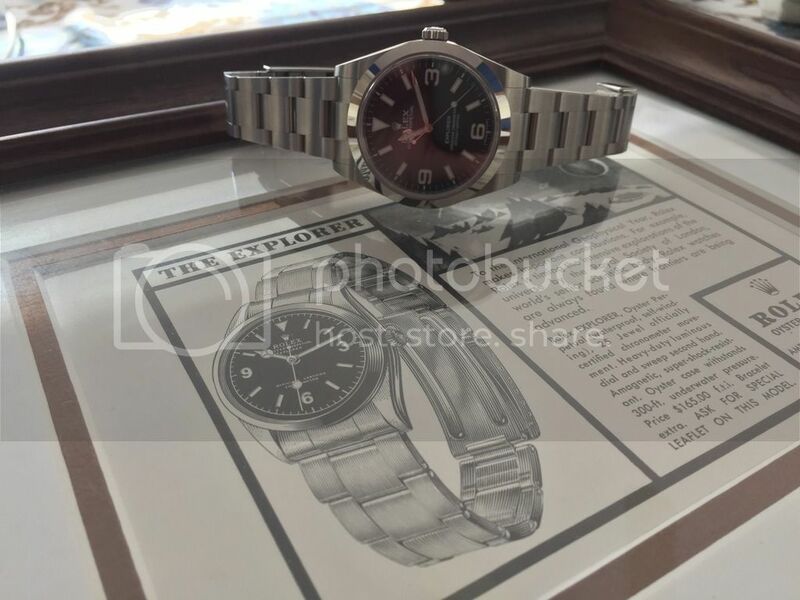 Why is the Milgauss more expensive than the Explorer? It must be because of the green glass. As a comparison, the new Air-King is EXACTLY the same watch as the Milgauss (same outer case, same inner case, same movement) except the dial and the crystal are different. But the Air-King is cheaper than the Explorer. But if I understand you correctly, and detracting the anti-magnetic precautions, the Exp movement has the same quality as the Mil ditto, or perhaps sporting an even better shock absorbing system? I've never owned the Milguass, but I think that is a very cool piece. I am VERY taken by the Explorer. I just bought the new version, and I think that Rolex really nailed it with this one. I had the 36mm version and let it go a while back. Made sense at the time, but I did miss it. The subtle improvements in the new version really make this pop. As I'm sure you know, this is the second version of the 214270, where the case was enlarged to 39mm. A perfect size in my view. However improving the Chromalight lume and enlarging the hands really improved an already classic watch. In terms of legibility and versatility, I prefer the Explorer than Milgauss. 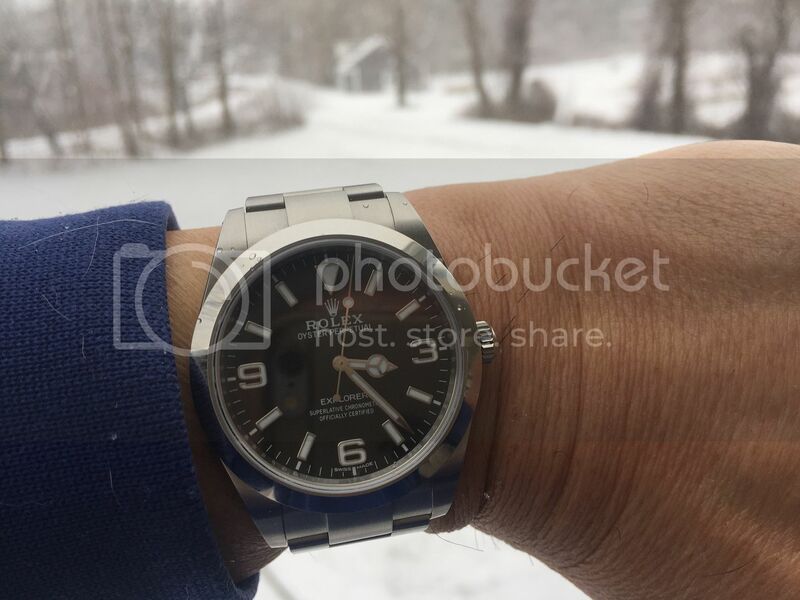 A 39mm Explorer would be a good choice for men. That assessment of yours I really appreciate. It is, indeed, the new Explorer which turned my focus on Rolex, which I had not done before. I like the whole idea of the Explorer, but foremost, of course, the piece itself - the clear and classic Rolex design, the nostalgic hour hand and the whole ruggedness of the watch. You have convinced me furter. I have my doubts towards the Milgauss, particularly whether I find the second hand too funky in the long run. It's somehow a very different species, while the Explorer is great classic optimized to the 100 %. ... I can't come to terms with the mixture of hour numbers and minute numbers - it's not to my taste. Pricewise, I know the Air-King is cheaper, but that isn't paramount for me. Your suggestion I appreciate, though - thank you! ... I have used search boxes eagerly without finding many owners of the Milgauss blue dial, so I guess it's kind of the odd man out in Rolex country. But intriguing it is, with the green glass and rightfully named "electric blue" dial. I have my doubts about the lightning seconds hand - would I find it slightly childish or even tacky - or would I appreciate it for being different and very consistant with the idea of the watch? Ah, such decisions aren't easy to make. I guess I have to find a really well-assorted Rolex store with both models and set them in juxtaposition. All Rolexes have some anti-magnetic parts inside the movement, parachrom hairspring for example. But the Milgauss takes it a little further by providing an inner case made of iron (or as Rolex calls it "a ferromagnetic alloy") that protects the entire movement. The new AK uses the exact same inner and outer case as the Milgauss. On waiting list for the new Explorer, can't wait. A long and carefully made decision for my first mechanical.